“Removing spent blooms will allow your Knockout Roses to focus their energy on producing new blooms more quickly. We recommend removing faded blooms as soon as you see them or every week. — John W., Prairie Gardens Plant Expert – Find him in our greenhouses! You should fertilize your knockout rose about every 30 days throughout the growing season, according to fertilizer label instructions. The more sun your Knockout Rose gets, the more blooms you’ll receive. Knockouts like full sun, so make sure it’s in a spot that receives at least 6 hours of sun daily. 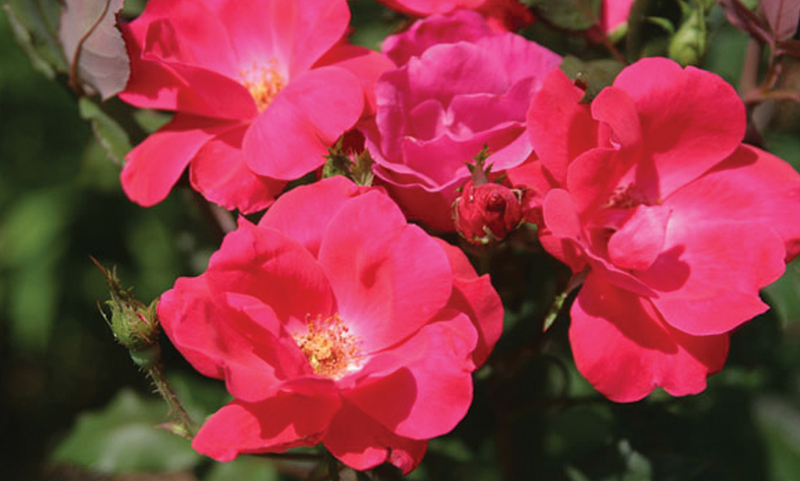 Although Knockouts Roses bloom on new growth, we recommend no heavy pruning during the growing season. Instead, do any needed heavy pruning before the growing season in early spring. Keep in mind when pruning that new blooms will start about 16-18″ from where you prune. Knockout Roses are pretty disease and insect resistant, so most don’t experience issues with insects or diseases, but fungal and insect systemics only help! Apply them according to label instructions. Your Knockout Rose should not need to be watered, unless we go through a hot, dry spell. When watering, make sure to water at the soil to help prevent any disease. Mulching can also help to retain moisture and prevent disease.